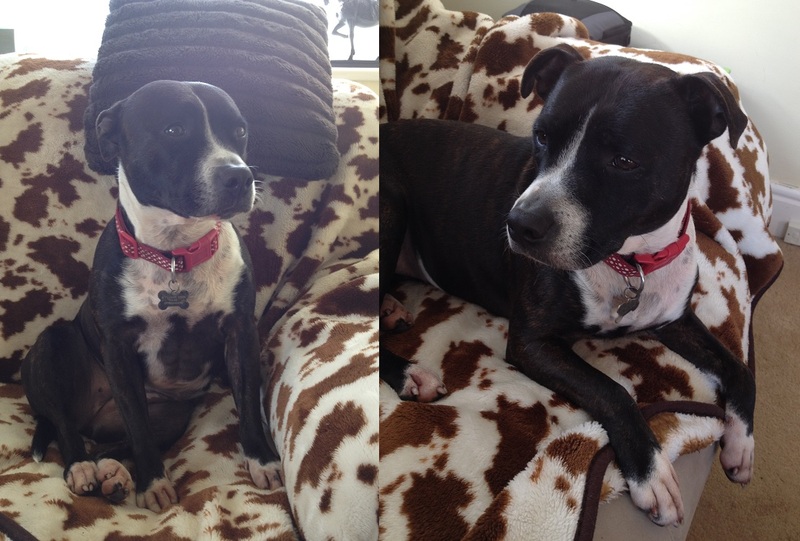 UPDATE: We are pleased to say that Millie has been rehomed. We will update this page with a paragraph or two on how he is getting on soon. Had my first meeting with Millie today. She is even more beautiful than the pictures. We had a short walk to the beach, on the way I had to get my sunglasses out of my car. Millie jumped in & sat on the seat. At that point ,before we got very far, she had my heart. walking adventure she promptly sat on my lap & fell asleep. I can hardly wait to bring her home so we can start our life adventure together. Truly a sweet heart of a dog. am bringing her home on Tuesday, I can hardly wait. Her new blanket that I am making is almost done. I know we shall be very happy together. Hurry up Tuesday I say. Brought Milli home today. She was very good in the car. She seems to be settling really well. We even had an afternoon nap together on the sofa. I bought her a new bed today & she has taken to it like a duck to water. Been for several walks & when we get back home, she has a big drink & then flakes out in her bed. She is so well behaved & quiet. When we first got home she had a good sniff about the place, followed me everywhere for the first couple of hours, now she barely lifts her head. I know Milli & I are such a perfect match & I am sure we will be happy together. She really is a very special little lady. She definitely has stolen my heart. Now it’s time for her last walk & toilet before bed. Another lovely day with Milli. She is such a joy. She is very bright indeed & woke me this morning so I could take her out for morning toilet. For the first day & night she has really settled into her new home. We went to the beach today again, she is a very laid back pooch. When she has had enough she turns around & wants to head home. She recognizes my car now too & is very well behaved in the car. We had a walk about 3 today it started to hail then rain, Milli couldn’t get home quick enough. This made me giggle out loud as she is trying to drag me home & get to the door, which she also recognizes now. Couldn’t have asked for a better pooch. Millie has been with me for almost a week. She is incredible, we have lots of fun, she loves running on the beach & paddling in the ocean. A friend & I took her for an afternoon walk along Eastbourne seafront yesterday, she was lapping up all the attention. So many people of all ages including young children came to speak with her. She loves humans attention, not so fussed about dogs. She gets on well with my neighbors dog & they enjoy playing in the gardens together. She has been so well behaved & so quiet. I couldn’t have asked for a better companion than Milli. As she sleeps on the sofa after her beach play today it seems as though she has a happy smile on her face, snoring away like a train. Bless her. I can hardly believe it’s only been 2 weeks since I brought home Milli. She has settled so well, her recall is amazing & I have just started to let her off the lead & today she was playing with Sapphire’s (waifs & strays volunteer) pooches. They had such fun. Milli is a little bit of a wooss when it’s raining. Trying to get her to go out to the loo today was funny. She ran to do her business & then dragged me home. She is such a character. I have never known a dog to sleep so much, & her time for bed it seems is 1045. At this time everyday for the last week she gets off her sofa & heads into my bedroom. She promptly curls up at the bottom of the bed & falls asleep. I love her snoring & she really is hilarious when she dreams. Her front paws move in unison like she is running after cats. Many of the little things she does everyday make me laugh out loud. My next door neighbours have heard me laughing & say that they have never known such a quiet dog. She plays happily with my neighbors dog, Nipper, but after about a minute Milli comes to my side & lays down without me telling her. She has totally transformed my life for the better. Milli is just the most amazing pooch. I can not imagine my life without her. She enriches everyday & even though she wakes me at 6.45 each morning with lots of kisses so I can take her for her morning constitutional I would not be without her. Match made in the Cosmos, just perfect. to hide one under the sofa blankets. She really does want to make sure they are safe overnight, off she goes to hide another. I am still laughing out loud, she goes through exactly the same routine each night hiding her treats. Such fun.